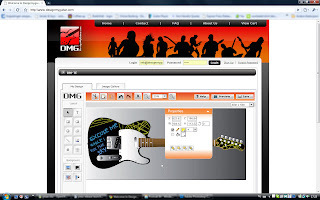 Design My Guitar is a new website that enables the user to design and have their dream axe built. Launching on October 1st, the Belgium-based company offers Strat, Tele and Les Paul body-types as a starting point, with the option of further customization. Or a complete redesign. Users will be able choose from a variety of standard tone woods for the bodies, necks and fingerboards, with pickup choices that include models from Fender, EMG and Seymour Duncan. And here's the best part, with a base price of 200 Euros, a fully-loaded model will not exceed 1000 Euros. And turnaround time for delivery is 14 days. I'm really looking forward to this one. It's about time I got that fretless guitar built. And if this guitar manufacturing model works, it could well be the alternative way guitars will be marketed in the future.